The following interview entitled, “women protests in Iran,” by Manel Mslemi appeared by Europa.blog, on February 9, 2019. 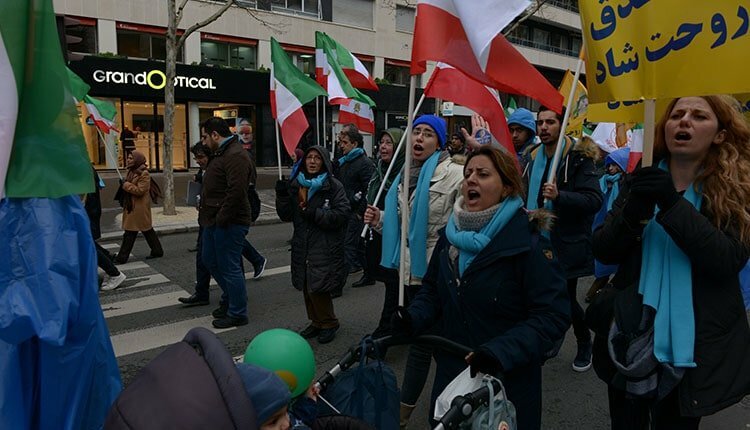 Paris, February 8 – A huge protest took place by the Iranian diaspora coming from so many European cities to show their solidarity with women protests in Iran and continue their fight for freedom, justice and democracy. We have met Mrs. Elaheh Arj, representative of the Women’s Committee of the NCRI who answered our questions. Q: Mrs. Ari, how do women participate in the Iran Spring and what is the key role played by them to implement justice and freedom? Arj: In Iran, women are present in all protests. Their significant presence remains under reported by the press; they have become beacons showing the way towards freedom and steadfastness. Abroad as well as at home, they are ubiquitous and play a decisive role as a driving force. We saw the massive presence of women and young girls in Paris last June and yesterday to support their sisters in Iran. Q: What are their occupations and in what ways are they engaged politically? Arj: They are in the majority of opposition rallies, such as the one in Villepinte last June, which brought together tens of thousands of Iranians from the diaspora in support for the democratic opposition, the NCRI. On Friday, 8 February in Paris, a large number of women were also at Place Denfert-Rochereau to support the ongoing uprising in Iran, calling for regime change and tougher policies against the misogynist mullahs. In Iran, they are teachers, students, nurses, plundered credit depositors, workers, pensioners, farmers, mothers of political prisoners or victims of executions and the list continues as does their grievances. They march through streets, rally in front of banks, ministries and the mullahs’ parliament; they gather wherever they can. Iranian women have participated in 850 acts of protests from March 20, 2018 (beginning of the Iranian year) to the end of December 2018. Q: You have evoked the financial crisis and the burden of poverty which pushed women to protest against the regime and for social justice. Can you explain to us the demands claimed by these women? Arj: Women teachers protest in all cities. In January, there were at least two demonstrations per week. Educators and their staff suffer blatant discrimination, demand job security, demand higher wages as their salaries are now aligned with the poverty line and call for the release of their colleagues, imprisoned for protesting. Nurses demand months of unpaid wages and lower workloads, many of them have died of exhaustion. Women farmers in Isfahan are on the streets with men demanding their water quota, as the diversion of the river and drought have ruined their farms. “Our enemy is right here, they lie when they say it’s the West,” “Rouhani the liar, what happened to our river,” they shout. Q: What is the role played by Iranian women at the forefront of politics to change the status quo? Arj: Iranian women were most courageous in the political turn of events in Iran protests that ignited at the end of December 2017- early January 2018. It was in fact a brave woman who was the first to shout, “Down with Khamenei” while facing riot police. This slogan spread like wildfire to nearly 140 cities across the country according to Deputy Minister of Intelligence Ali Rabii. Students in Tehran shouted, “Reformers, hardliners, the game is over!” putting all of the regime’s factions in one theocratic basket. In this uprising, women called on others to join demonstrations, they spread courage or inspired the fearful. They were the ones who first launched slogans that raised the crowds. Q: So, what is the message that you want to share with women in the world and how can they support your movement? Arj: On the eve of the 40th anniversary of the revolution against the Shah, thousands in the diaspora are determined to convene in Paris to make the voices of their sisters in Iran heard. They will defend those struggling with poverty and repression, sexual segregation and discrimination. They will come from all over Europe and North America to Paris and demonstrate at 2 pm in Denfert-Rochereau. It will be a message to convey the Iranian people’s thirst for freedom. They rely on solidarity and sorority.